A buck with an impressive set of antlers mills around at a deer-feeding operation run by Mark McBreairty in Allagash. 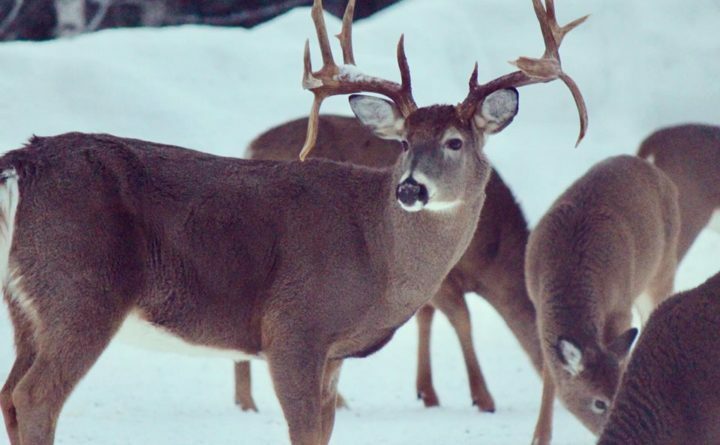 But sometimes those claims — in this case, “a truly magnificent buck!” which appeared on the Facebook page of Tylor Kelly’s Camps in Allagash — are 100 percent accurate. The video shows a male deer with a set of massive antlers. Sue Underhill Kelly, who took the video, said she has counted 13 points, but said there may actually be 14 points on the rack. The deer meanders slowly as heavy snow falls. The video and subsequent photos Kelly shared aren’t the result of a chance encounter. The buck, which sports long droptines on each side, has turned into a bit of a local celebrity. Full disclaimer: State wildlife officials caution Mainers to avoid feeding deer for a variety of reasons, but feeding operations such as McBreairty’s are not uncommon. — Feeding concentrates deer in smaller areas reducing size and effectiveness of trail networks. — Concentrating deer in smaller areas can create a feeding ground for predators. — Concentrating deer in smaller areas may increase their vulnerability to diseases such as Chronic Wasting Disease. — May cause long-term impacts on deer behavior as they lose their wariness of people. — Feeding sites can significantly increase deer/vehicle collisions. — Winter feeding is expensive. One deer requires 2 to 5 pounds of feed per day, depending on the quality of feed.